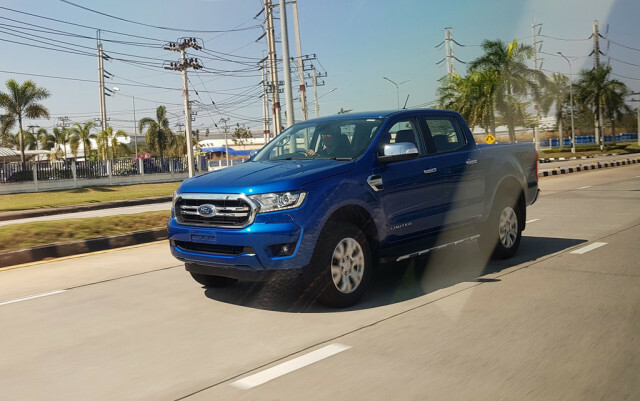 Ford is bringing back the Ranger for 2019 and the first photos of the mid-size pickup truck have hit the web. The photos were posted to the NewRangerClub forum and show the Ranger designed for Thailand and other Southeast Asian markets. The version we’ll get will feature slightly revised styling and extra features. The 2019 Ranger is expected to make its world debut on January 15 at the 2018 North American International Auto Show in Detroit. Although the vehicle is all-new for the United States—we haven’t had a Ranger since 2011—it actually represents an update of the T6 Ranger that’s been offered globally since the start of the decade. Underpinning it is a body-on-frame platform developed in Australia and used in a Ranger-based SUV dubbed the Everest. Ford engineers are working on an updated Everest alongside the Ranger, and this might end up being our new Bronco coming for 2020. It’s too early to talk powertrains but the Ranger currently offered globally has a pair of diesels: a 2.2-liter inline-4 with 158 horsepower and 284 pound-feet of torque and a 3.2-liter inline-5 with 197 hp and 346 lb-ft. It’s likely the 2019 Ranger will offer gasoline mills in the U.S. but a torquey, fuel-sipping diesel would be a nice addition to the options list. Ford is also cooking up a Ranger Raptor. The performance pickup is due for a reveal on February 7 and is likely to skip the U.S. since we already have the F-150 Raptor. The Ranger Raptor is also expected to come exclusively with a diesel engine thus further reducing the chances for our market. Production of the Ranger (and Bronco) for the U.S. will take place at a plant in Wayne, Michigan. Potential rivals are the Chevrolet Colorado, GMC Canyon, Honda Ridgeline, Nissan Frontier and Toyota Tacoma. We're giving away the Honor 7X — Enter now!